3M™ Extreme Sealing Tape, also referred to as “single sided VHB™ tape” is a flexible, tough, single coated adhesive tape that conforms over edges, contours and even screws and rivets. 3M™ Extreme Sealing Tape holds securely through sun, rain, snow, temperature extremes and humidity for an instant seal that rolls on fast and looks good. Extreme Sealing Tape also saves time and money by eliminating the need for additional tools that require storage and cleaning, and create unnecessary waste. Looking for a solution to your difficult sealing problems? Contact us today to spec in this product and find out if 3M™ Extreme Sealing Tape is a good fit for your application. 3M™ Extreme Sealing Tapes are available 40 mils or 80 mils thick. Standard tapes are 0.75″, 1″, 2″, 2.5″, 3″ and 4″ wide on a 3” core tube. LAMATEK can also provide custom width tapes by request. As a 3M™ Select Converter, LAMATEK also manufactures custom die-cut Extreme Sealing gaskets and custom fabricated parts. Proven 3M™ acrylic adhesive conforms over contours, edges, rivets and screws for a water tight seal while the tough ionomer backing resists abrasions and harsh conditions. The adhesive is designed to adhere well to the ionomer film so that overlapping tape joints can be made while maintaining a strong seal. 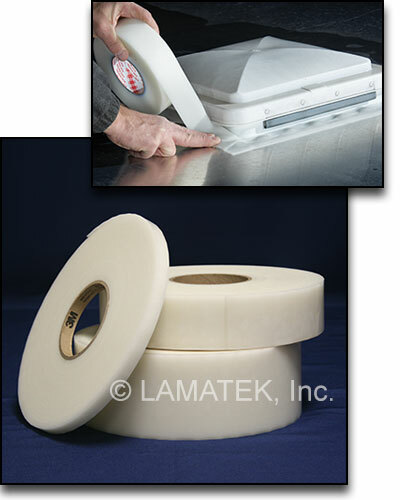 It is often required to overlap 3M™ Extreme Sealing Tape onto itself. In this case, the ionomer backing of the first piece is one of the substrates to which the second piece of tape is bonding. The tapes should overlap at least 2 cm (3/4 in).